Had you been in Finland last night, you would have seen a lot of cheery people out and about wearing rather silly looking sailor-like caps, most dressed in overalls or colourful outfits. The reason for all this cheeriness was Walpurgis night (vappu, in Finnish), which is the biggest spring festival in Finland, and many of those celebrating were university students wearing their high school graduation caps and university overalls. This festival brings people outdoors and today - first of May - you would see many Finns enjoying picnics in the parks and outdoor areas. There are also the Socialist traditions connected to this day - you may see some political agitations held, but overall today is about celebrating spring and the summer months to come. Since vappu is a carnival, the food served is also quite festive. Sima, a home-made non-alcoholic mead is enjoyed with typical vappu doughnuts and funnel cakes. At the first of May picnic you could be served open herring sandwiches, potato salad and other savoury dishes flushed down with sparkling wine or cider. Vappu used to be the only time of the year my mum would make doughnuts. She disliked deep frying and this was the only occasion she would agree to make such unhealthy treats. These doughnuts are typically made with a similar dough to Finnish cinnamon rolls and then deep-fried until golden brown. 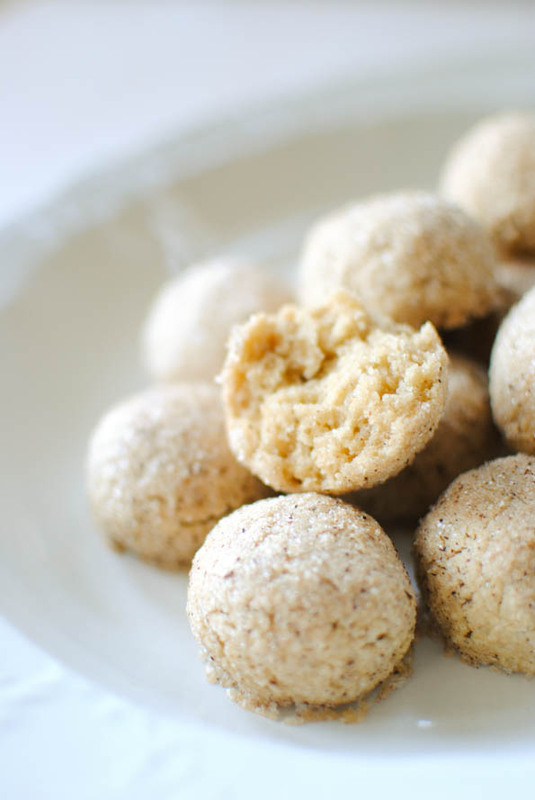 I've tweaked the traditional recipe making them gluten- and dairy-free and using coconut oil instead of butter. I've also opted for a healthier baked version and I am very pleased with the outcome. These vappu doughnuts take me right back to spring in Finland! * I used Orgran brand plain flour that is a mix of maize starch, tapioca flour and rice flour. 1. Preheat the oven to 180C and line a roasting tray with baking paper. 2. 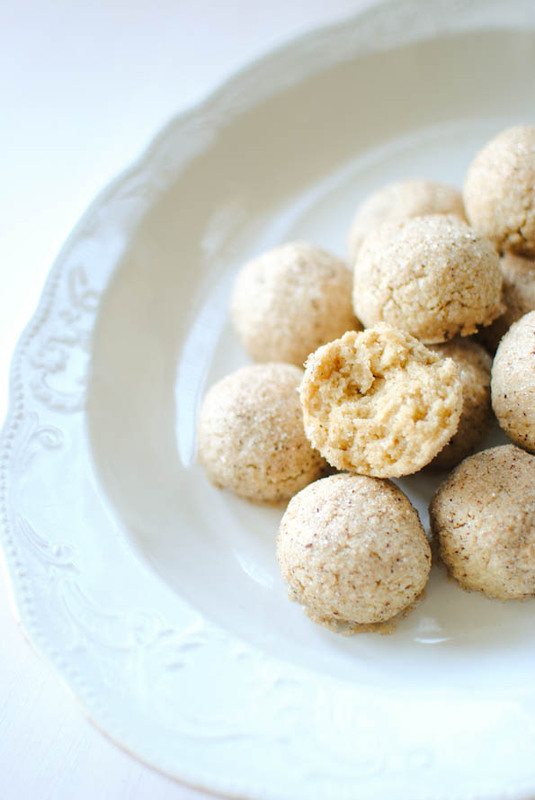 Mix the flour, sugar, baking powder, cardamom and salt in a bowl. 3. Stir in the water, egg and coconut oil (can substitute with vegetable oil or melted butter). Stir to make a smooth but sticky dough. 4. 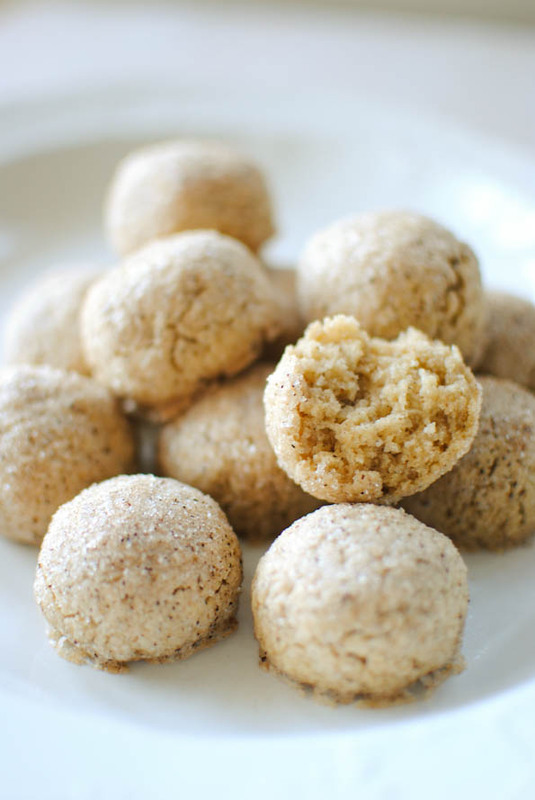 Using your hands, roll the dough into 15 small balls and coat each ball with vanilla sugar. Place the balls on a roasting tray and bake for 15-20 minutes. Serve warm. hope you have some local Finnish friends you can celebrate with Maria! These look delicious and happy belated Walpurgis night! I was just thinking at the beginning of the post that they don't look deep-fried and was delighted to read later on that you made them baked. Love discovering new treats from different cultures :). Those doughnuts look fabulous! I just love the way Scandinavians use cardamom and spices. Delightful! yum! A guilt free donut, looks so tasty. Happy celebrating! 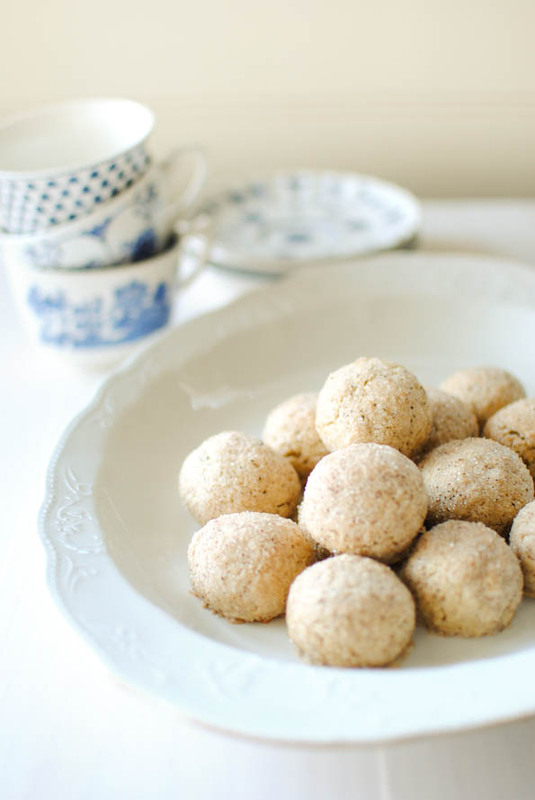 These cookies look delightful; love the faint taste of cardamom in them! In fact, these days I am thinking more and more of cardamom. What a great holiday celebration! That picture of the flower is gorgeous! Yummo! These photographs make my mouth water! Love the sounds of the festival! And these doughnuts are fantastic. Love the post, Maria! A celebration AND donuts?! I'm in!! I love how each culture has its own version of the universally popular donut! Happy Vappu Day! They look delicious. Oh WOW! They look positively gorgeous. I have everything in my cupboard except for coconut oil, will have to pick up some today, this looks so easy to put together.. Will be the perfect dessert for my Masterchef Party tonight! I'm baking these right now. I had to use significantly more flour though. I converted by weight which is perhaps not what you intended with this recipe. They look and smell delicious though! Megan, the dough is supposed to be sticky. If you add too much flour it will make the doughnuts hard. If you find it hard to roll them into balls, using wet hands should make it easier. Good luck, I hope you like them! Wow, I had no idea this type of festival existed in Finland! Sounds like a great event. These doughnuts look delicious and I LOVE that they're gluten free! Healthy doughnuts :) I made the original ones :) and also sima! Ihanat gluteenittomat vappumunkit! Ja ensimmäinen kuva on mahtava! These look like a really wonderful treat! More healthy than original ones and I bet even more tasty! I love cardamom - especially since starting to visit family in sweden so often - these will have to be cooked up in my kitchen. Mats will probably do backflips in delight! This sounds like SUCH a fun festival! And the donuts...oh those look like the perfect late night treat! great GF and vegan recipe! thanks for sharing. my boyfriend will be thrilled. :) bookmarking this with my cookmarked.com account ! doing this as of right now! Will post about it not this week but next as I have other things planned but this is something my son will just love and I have to put this computer down and make them! Thanks girl! I LOVE that picture of the flower! Gorgeous! 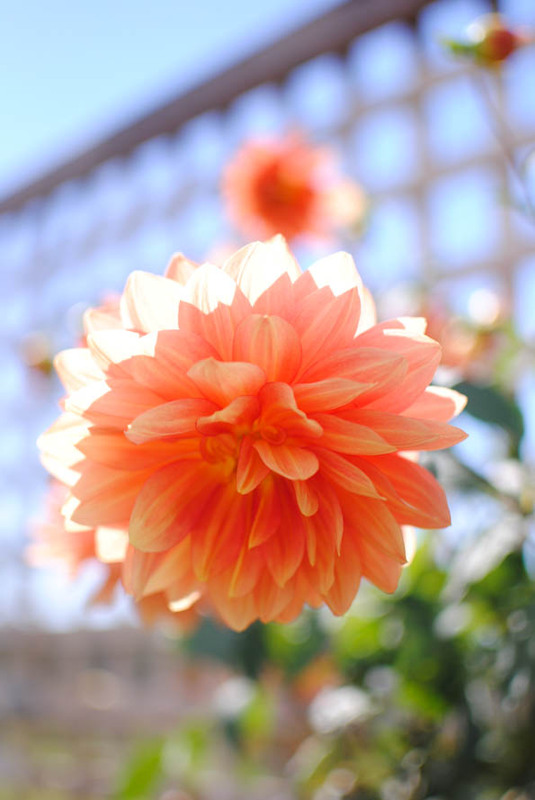 Happy Walpurgis!Your orange flower is pretty stunning! These look unbelievably good. Am enjoying your tweaking toward a gluten free version and the pic of the flower is lovely. sorry Maria these donuts look too healthy i would drizzle some dark chocolate over them or something haha :P kidding they look great !